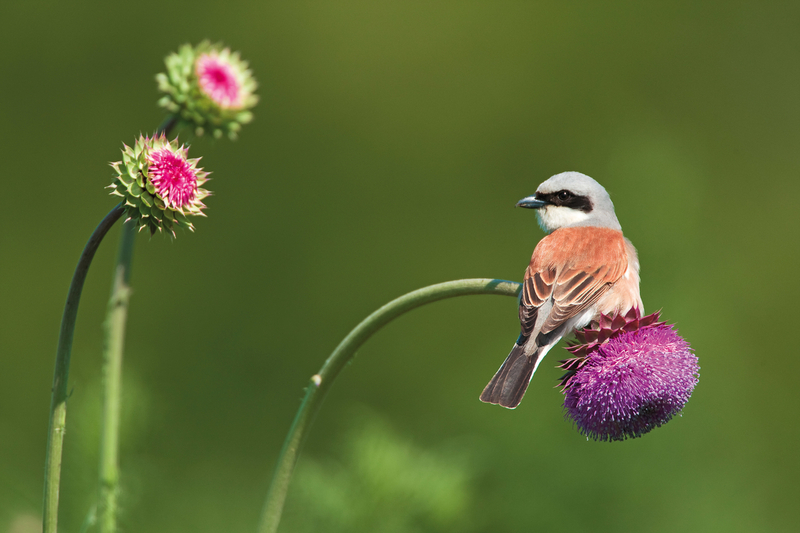 Red-backed Shrike male (Lanius collurio) on a Musk thistle (Carduus nutans), Rhodope Mountains, Bulgaria. In a huge vote at the European Parliament last week, Europe’s political representatives have stood up to defend key under-threat EU nature laws. By an overwhelming majority of 592 to 52, Members of the European Parliament (MEPs) voted to approve a report on the Mid-term review of the EU’s Biodiversity Strategy, which calls for the protection of the Birds and Habitats Directives. The report was an ‘own-initiative report’ led by the Belgian MEP Mark Demesmaeker. This vote highlighted the importance of the Birds and Habitats Directives and the need to fully implement them. The 20 organisations that signed the position paper on the Habitat and Bird Directives, working together under the European Habitat Forum. The European Parliament vote follows on from a meeting of the EU Environment Ministers last December who expressed similar views in the Council Conclusions they adopted regarding the outcome of the ongoing evaluation of the Birds and Habitats Directives. Before the December 2015 meeting, 20 European conservation organisation, including Rewilding Europe, presented a joint paper called ‘Action for Biodiversity in the EU and the Fitness Check of the Birds and Habitat Directives’. This joint paper which was developed under the umbrella of the European Habitats Forum incorporating 17 action points that are crucial for maintaining and restoring Europe’s nature and biodiversity. It also showed that the Fitness Check evidence is crystal clear – the Birds and Habitat Directives are fit for purpose and there is no case for “merging and modernising” them. Last week’s Parliament adoption comes after over half a million citizens across Europe who expressed their support for the Nature Directives during last years NGO-led campaign Nature Alert. 11 EU governments representing a majority of the EU population have also explicitly called on the European Commission to safeguard the Birds and Habitats Directives and step up their implementation. Members of the European Parliament have also encouraged the Commission to address biodiversity loss outside protected areas and sent a clear signal to the Commission that they oppose a revision of the Nature Directives because this would bring about a protracted period of legal uncertainty and would be bad for nature, people and business. The Nature Directives (the Birds and Habitats Directives) are a crucial part of the European Biodiversity Strategy 2011-2020. Halfway towards achieving the 2020 targets, the ecological footprint of all EU member states is twice as large as their ecological biocapacity. Barely 23% of the species and 16% of their habitats are in a good condition. Investing in nature and biodiversity is necessary for nature, people and the economy. The final decision on the future of the European nature laws is expected by June 2016.